Forever the Sickest Kids is an American rock band from Dallas, Texas, who are currently signed to Universal Motown Records Group. In issue 228 of Alternative Press, the group was named the number one underground band in the "22 Best Underground Bands (That Likely Won't Stay Underground for Long)". Their first EP, Television Off, Party On, was released on July 3, 2007 Their second EP, a split release with critically acclaimed pop punk band The Tattle-Tales, was released on February 14, 2008. Their debut album, Underdog Alma Mater, was later released on April 29, 2008. 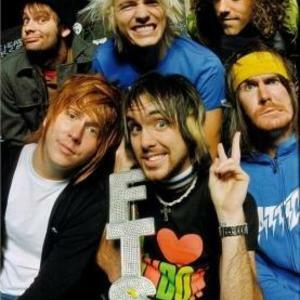 Although Forever the Sickest Kids have only been around for just over three years, their roots date back to the members' childhood. Marc Stewart (Guitar) and Kyle Burns (Drums) are stepbrothers. Stewart met Kent Garrison (Keyboard) in high school. Then, when Garrison went to college, he met up with Jonathan Cook (Vocals) and Bello (Bass Guitar). For a while, Turman and Bello played together and called themselves Been Bradley, while everyone else from Forever the Sickest Kids played with The Flipside. But in late 2006, both of those groups reached a creative standstill, and FTSK was born. While browsing the music website Purevolume, lead singer Jonathan Cook inadvertenly spent 350 dollars that the band didn't have to receive a front page placement of a song they didn't have. So they went into the studio and wrote "Hey Brittany", then recorded it with their producer Geoff Rockwell in a matter of days. Forever The Sickest Kids along with We The Kings supported You Me At Six on their sold out U.K. tour that started on March 9, 2010 to the 20th. The other two parts of the 3P, The Weekend: Saturday and The Weekend: Sunday, are set to be released in the Spring and Summer of 2010. A single from the upcoming 2010 album The Weekend: Saturday was released on You-Tube June 6, 2010. It is called 'Keeps on Bringing Me Down'. They were also awarded 'dumbest band name of 2008' according to AP Magazine. Also, they appeared on MTV's show Silent Library.